Aerial of lava burning road in abandoned Royal Gardens, Hawaii. Photo taken 2/28/12 by Adam Greenblatt. Had an exciting trip to check out the flow field Tuesday, with Adam G. as my intrepid assistant. 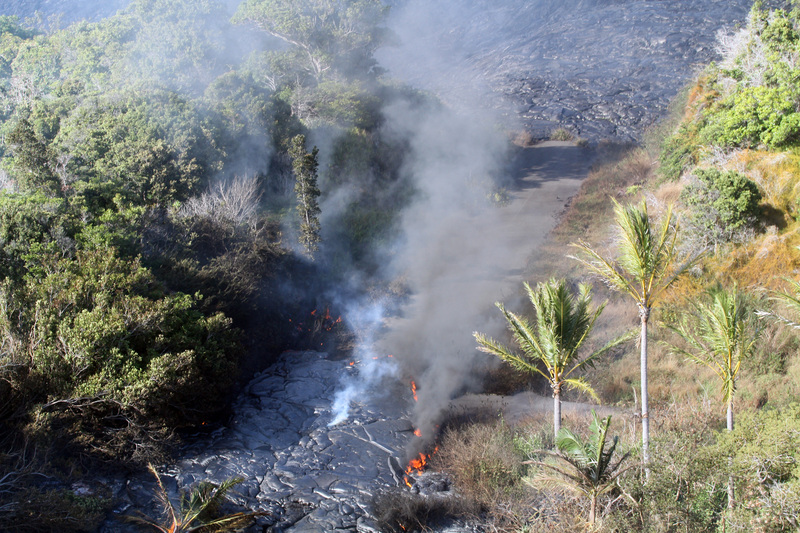 We had a quick flight to get some aerial reconnaissance photos and figure out what the lava was up to. We were dropped on what I believe was Orchid Street in the small eastern kipuka of Royal Gardens subdivision. Lava was up above us, beginning to cross Paradise, and making its way towards an abandoned house in the forest. We spent some time hiking up and down the steep hillside filming the creeping lava flows and burning vegetation. Saw and heard lots of methane explosions. Fires kept whipping up in the wind and it seemed that the house might burn before lava got close. 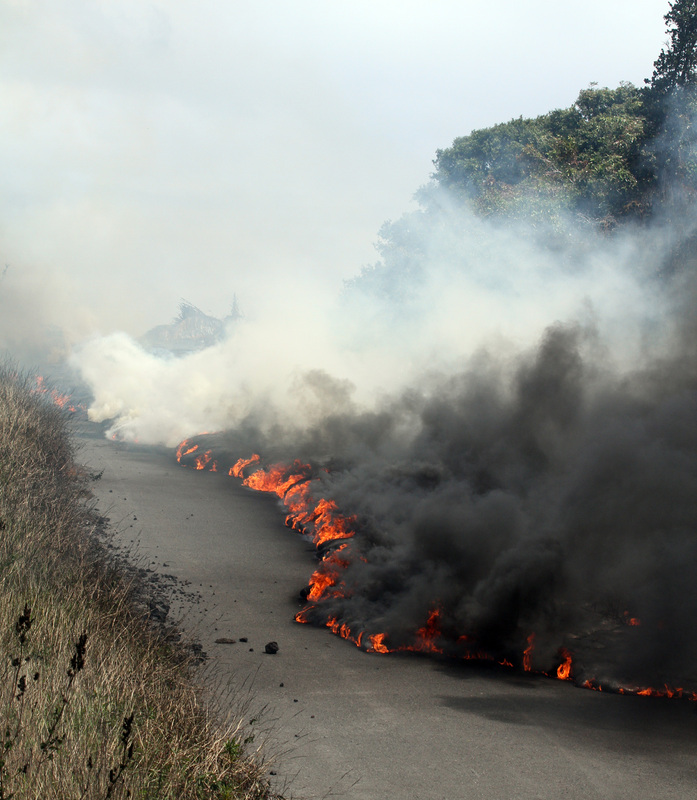 We crossed to the other side of the kipuka to see lava coming down Paradise road. 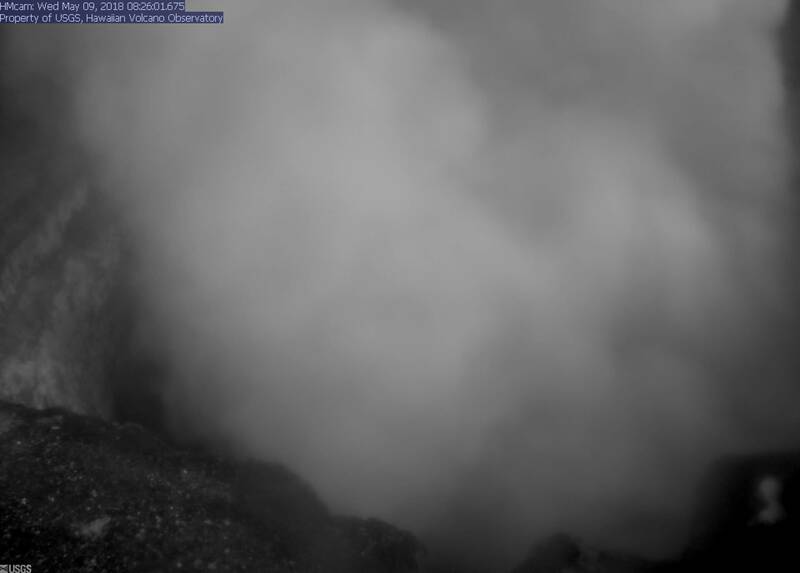 It had just about reached the west side already and as we watched, began moving down the west side of the kipuka. We had to stand downwind of the burning asphalt, which is pretty horrible stuff. Good thing the gas masks worked perfectly, no problems. It’s just that we ended up covered in sticky soot. But it was worth it to watch the lava. The hike down the pali and back out to the truck was tough and the rain finally hit, but all together a great day. Lava burning road in Royal Gardens, Hawaii. Photo taken 2/28/12 by Adam Greenblatt.